Well hello! How was your holiday week? We were away in Disney and had an absolutely wonderful time. We have fallen hard for WDW over the past few years and it's always such a special trip for our family. I'm back today to share another room in our new house! I say this about all of them, I know, but this is one of my favorite spaces. You may remember that we did away with our dining room in our old house and turned it into a library instead. I never regretted that because we had an eat in kitchen that served our needs just fine. 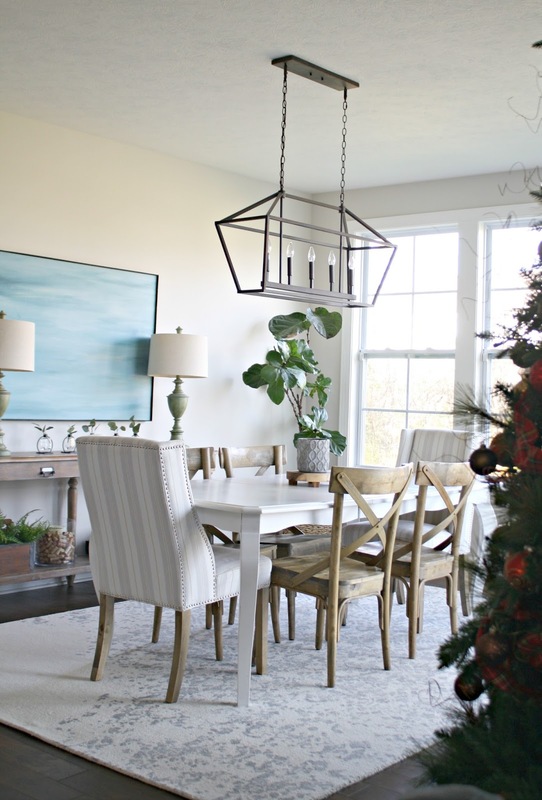 In this house, one of my favorite things was that there was no dedicated dining room. The kitchen is long and at one end there's what I consider an eat in area. I guess it could be called a dining room but it's so open to the rest of the great room I just consider it part of the kitchen. I mentioned before that I started to decorate things the exact same way I did in the old house and it hit me I could change things up -- it was allowed. 😂 So that's what I did. 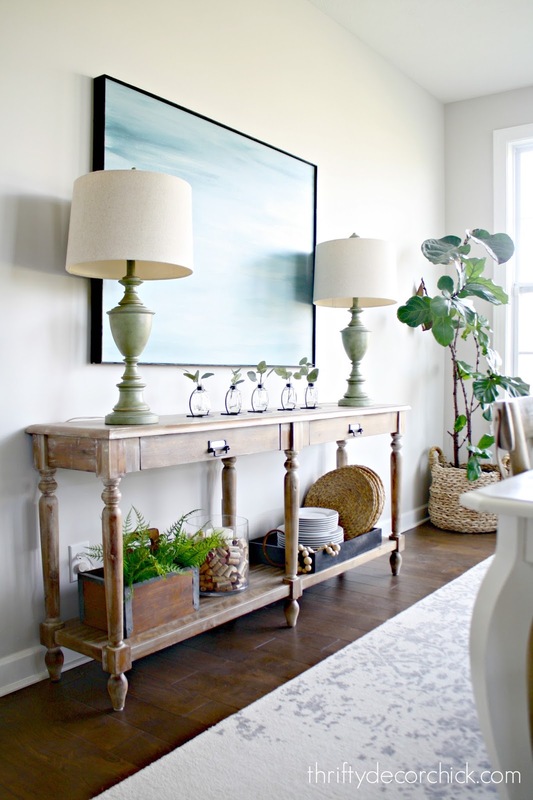 I've gone MUCH simpler with the decor in this house because I want to let the beauty of the home shine through. I'll link to all of the products in this post below, so be sure to check that out! We've had the table for years now and it's nice and long -- it took me forever to find an affordable long table. It came unfinished and I painted it white, but it needs another coat or two of paint now. I haven't had a rug (let alone such a light one!) under a table for some time, so we'll see how it works out. I have to say I love the look of it! We didn't have one underneath before because the table was so open to the family room and was right next to another rug. I've had SO much fun decorating this house for Christmas! I'll show you more soon. There you go, another room tour in the house! You can see the powder room here, the foyer here and the mud room/laundry combo here if you missed any of those. 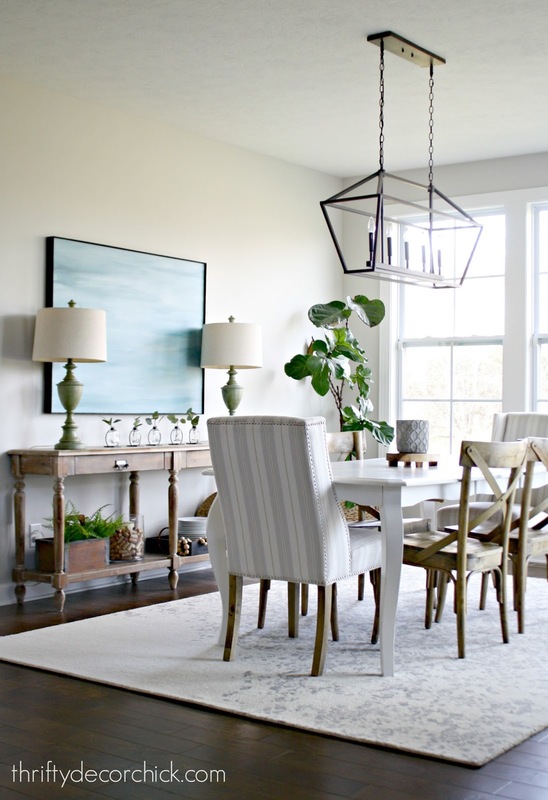 Long chandelier: Houzz or on sale here for today! Wall color can be found here! I love love love the light!!! And your art looks great there! That is an amazing light! Everything looks "new" in this house even though I recognize the pieces. "Allowed to change up." I know that epiphany oh so well! From years of apartment living to building my home with Habitat for Humanity. My son actually had to remind me this was our home and we could garden/decorate as we pleased! What a beautiful space and that's such a pretty light! Love the setting in the kitchen. It looks good and the light is cute! I love your chandelier! 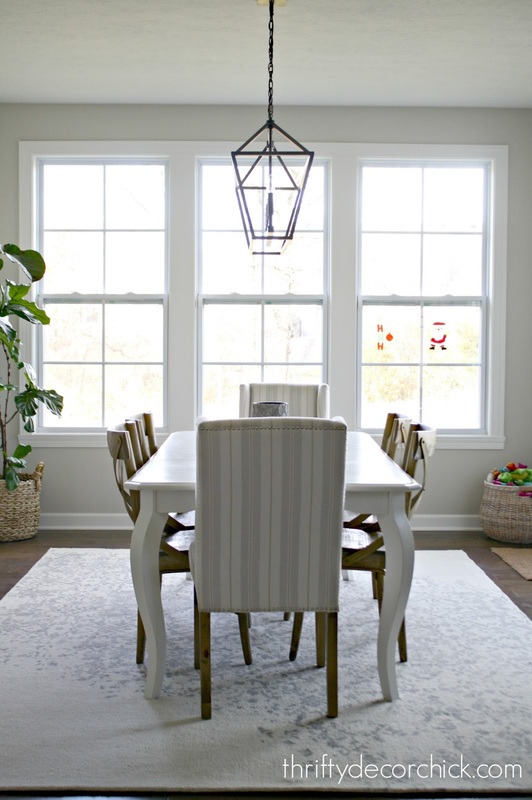 Our "dining room" has the exact same placement in our house but instead of 2 walls full of windows/doors, we have all 3 walls with windows (well, actually 2 windowed walls and a wall of French doors leading to the screened porch). It's my favorite room with so much sunlight not only in the dining room but also the kitchen! Your house is absolutely beautiful! 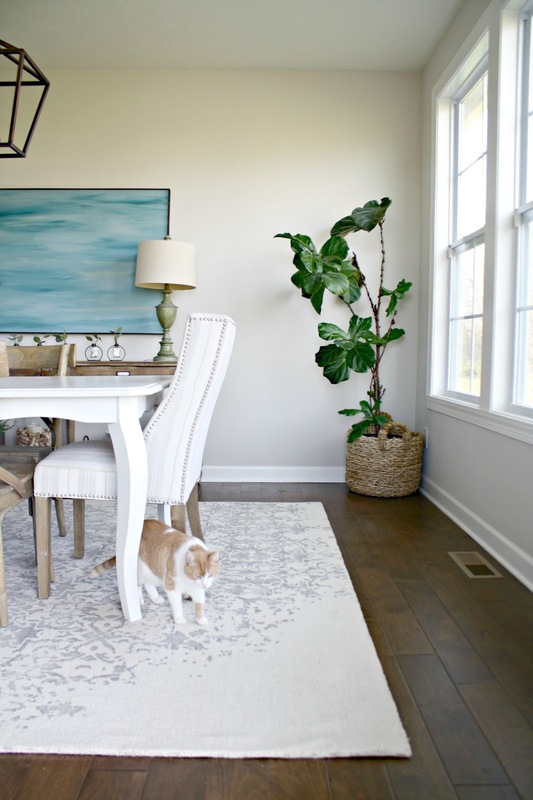 I love your beautiful dining area. Also love the sliding door full of paned windows. 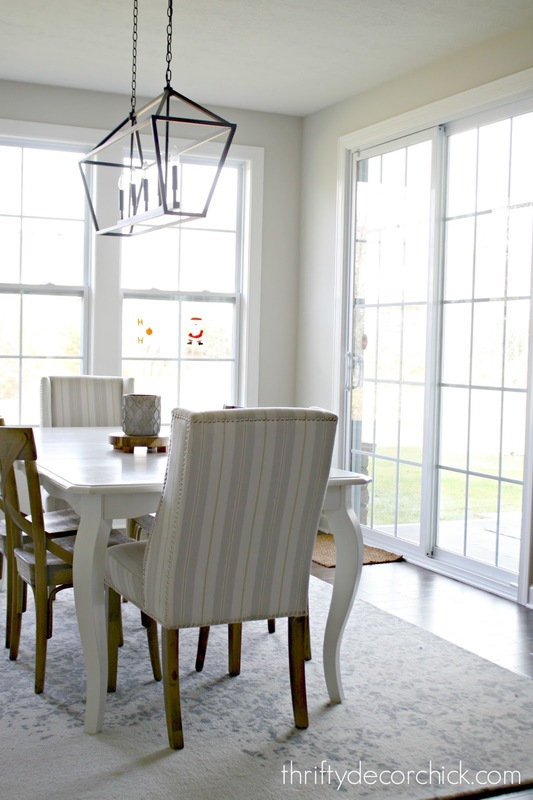 I love natural light coming in to any room, but in the gray days of winter in Indiana, I would soften that door with lightweight draperies. Also, is there not a privacy issue with no window coverings at all? I love the long table you have along the wall. Its exactly what I am looking for to go in my entry way. Where did you buy it from? 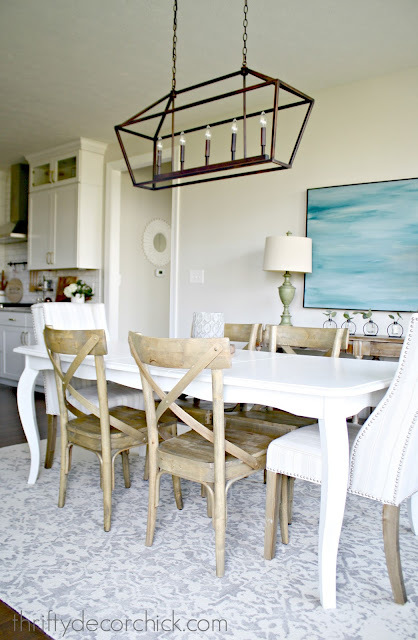 Does the chandelier give off much light? It's so beautiful! 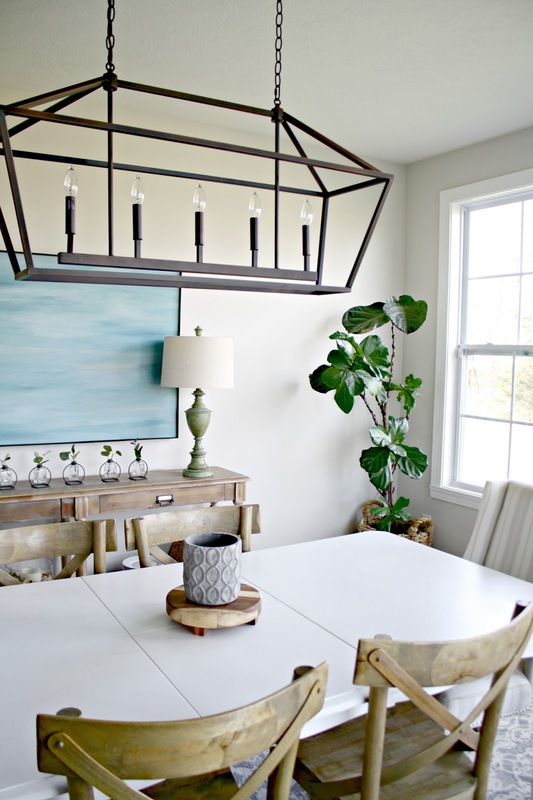 I have been admiring that chandelier for a while and love it over your table. I've been seriously considering it for my dining area. The website shows it being suspended with rods. Did you replace the rods with chains? I love the chandelier! 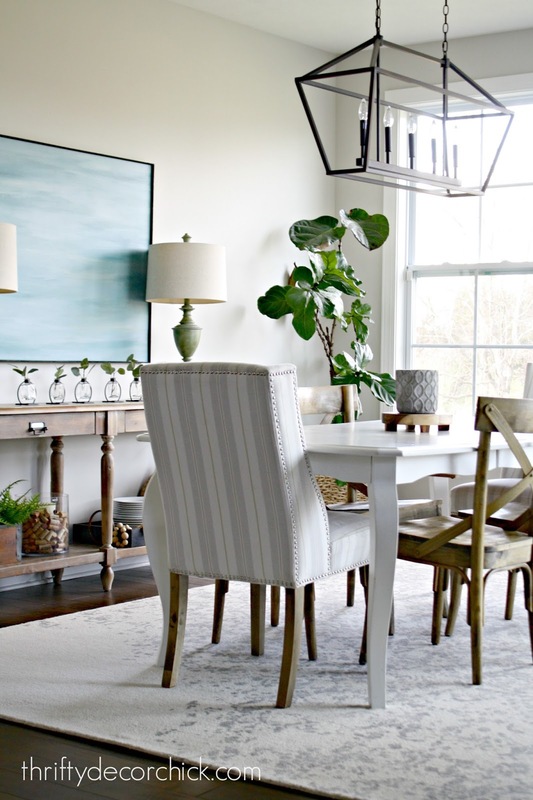 I bought a similar one for my dining room from World Market, but it has glass on the sides, which are always dusty! I think yours will be so much easier to keep clean! Maybe? Sure you have a plan for this but how will you put a window seat over the heating vent under the window? I LOVE your open floorplan and large spaces! I am wondering if your floorplan is online? We will be building again soon and everytime I see pics of your new house I show my husband and say, "like this...." :) I will be honest, my heart hurt a little when you announced selling the last home. As a long time reader I felt a little attached to your old house. Sounds so silly doesn't it! But your new house is date I say, even better! Can't wait to see how you continue to make it your own! I love your new house ... I loved the previous house too. Did you paint the white table? It is just like mine and I have been thinking about painting the top.